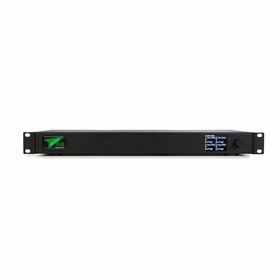 The Dante interface links up to 8 audio streams from and into the Green-GO network. The Dante interface will directly convert digital audio streams from Dante or AES67 to Green-GO and vice-versa, without the conversion losses that occur during analog to digital (and contrary) conversion. This allows various audio signals to be injected into and extracted from the Green-Go Network. All ports can be configured individually through the setup menu of the Dante Interface. The Dante ports are manageable with the Dante Controller. Each of the 4 dual ports can operate in a full user based mode or a general purpose line in/out mode. The Dante interface has a large TFT color screen for easy and quick setup and menu navigation. The display will give a quick overview of transmitted and received audio signals and levels.